The Theta Girl, a feature film produced by first-time filmmakers David Axe and Christopher Bickel, is coming to film circuits this Winter. The film had its world-premiere in Atlanta on Friday the 13th of October at midnight -- a fitting time slot for opening what director Christopher Bickel calls "a brutally violent existential horror film." At the Atlanta screening, several audience members walked out of the film following one shocking scene depicting a violent home invasion. The audience members who remained were very vocal and enthusiastic about their enjoyment and appreciation of the film, one audience member writing in a comment online: "Holy sh*t! Talk about a low-budget MASTERPIECE. A gory drug-induced mystery! A psychedelic B Movie thriller! 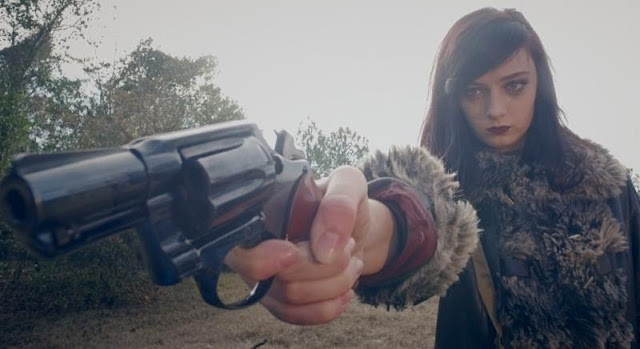 Roger Corman-esque Punk cinema that's WAY better and smarter than it should be! A++++++"
The Theta Girl was produced on a shoestring budget of $14,000. To put that budget into perspective, the film could have been made 3,571 times over for what it cost Hollywood to make one Emoji Movie. It is the first film for Axe and Bickel, and indeed it was the first film for the majority of cast and crew. Though the film exhibits some rough edges as a result of its extremely low budget and the experience level of the creators, it has been enthusiastically praised for its high entertainment value, thoughtful existential themes, and shocking content.